You've got the magic formula that will make you the Master Magician. But where can you get the rare ingredients you need? 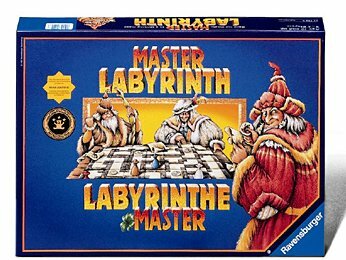 Off you go into the labyrinth in search of crystals, mandrake, emeralds, and more. But be careful: the winding corridors shift constantly, and it's easy to get lost! Earn points by racing to claim the special ingredients in sequence, or try to gain extra points by achieving their secret assignment. When all the ingredient tokens have been collected, the player with the most points wins. For 2-4 players ages 10 and up. This is a great children's game and quite fun for participating adults too. Often, the children cannot completely predict the outcome of sliding a particular piece of the board - but when they grasp the concept, there are ample opportunities for showing the adults that they can think tactically too.